Established in business in 1971 having previously studied Agricultural Engineering but soon decided that fast cars and bikes were more fun. Having worked initially in the family garage business and on commercial vehicles Tony joined Nerus Engineering a subsidiary of the old Rother Iron Works in Rye, Sussex. Nerus in the early sixties were well known for tuning work on B.M.C. engines and also supplied heads in various stages of tune for Ford and Roots Group vehicles, they also produced the BMW engines for Elva MK7 and MK8 sports cars plus the 160 GT and one or two Chevron B8s. 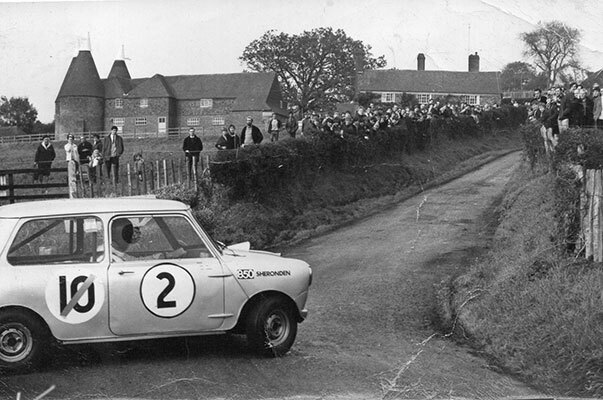 The end of the 1969 season saw a return to Nerus in their new car preparation shop now established in St Leonards on a new industrial estate joining old friend Nick Cole with whom he had raced, co-owned and prepared Minis, this under Frank Webb ex HWM, WESLAKE & RYTUNE. 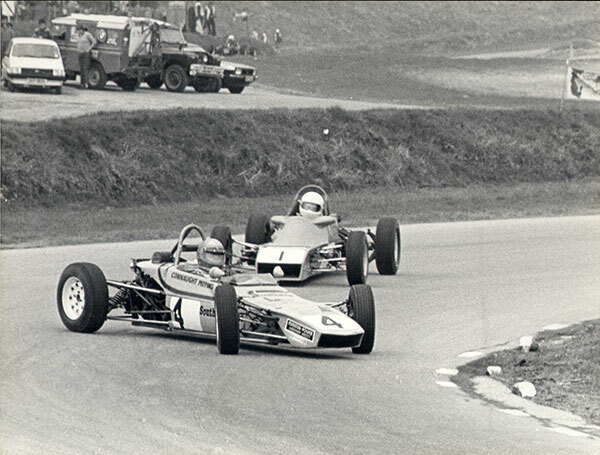 During this second stint at Nerus some interesting projects were undertaken including the building of the Cedric Selzer designed Nerus Silhouette for the F100 formula promoted by John Webb at Brands Hatch and Nick came second in the series 2 years running to Ray Allen in 1970 and Tom Price in 1971. 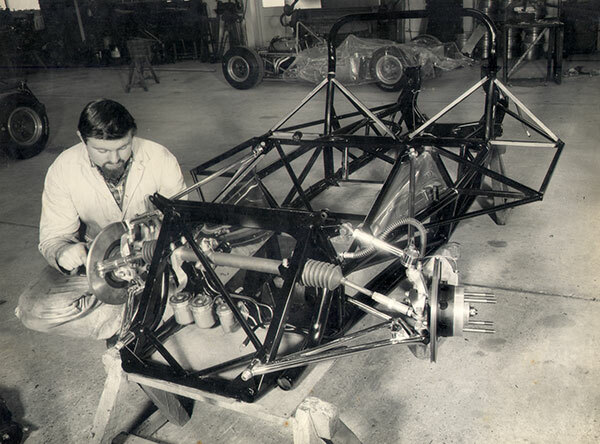 Tony started A.J.Barnard Engineering in April 1971 giving up Mini racing at the end of that season to concentrate on the business. Originally based near Hastings dealing with a variety of road vehicles but still doing some race preparation mostly on Minis and Formula Ford (Merlin, Royal and a rare Gineta FF). During the 70s & 80s the core business centred around the garage trade, agricultural engineering and commercial vehicles but always with a side interest in motorsport and classic cars, this activity increased throughout the 80s with involvement in the formula Ford pre 74 Championship assisting winner Paul Sleeman to the 1984 title in a Rostron and also in champion of Brands in FF1600 with Leyser and Van Diemen again with Paul plus a March 713S with an AJB built 2 Litre twin cam Ford engine used to win the Lydden Liber championship, Paul also won the Autosport Golden Helmet Challenge for the most wins by a club driver in one season counting wins in both the Rostron and March in 1984 Later a 2 Litre Chevron Sports 2000 uprated to run in the full 2 Litre class and driven by Paul Sleeman & Andy Ackerley in Thundersports , this car was run by Bob Barnard of Connault Motor Company with technical assistance from Bob Curl and A J B.
AJB also did the engines for Ford Fiesta XR2s in the Credit Fiesta Championship and also ran SDI Rovers in the Uniroyal British Saloon cars, forerunner of British Touring cars including building the engines that did 3 Willhire 24hr races between 1985 and 1987. In 1988 Tony accepted John Playfoot’s invitation to drive his MK 1 Elva Courier VGN111 for which AJB provided the engine. This car was run in the MGCC Pre 66 Challenge winning the class in 88 and 89. 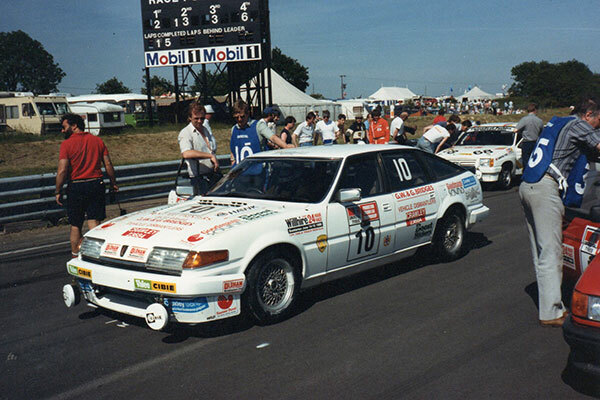 Alan Miles then took over the driving and won the class in 1990 and the championship overall in 1991 in what had then become the TSCC. At the end of the 1980s it was decided to move away from the commercial and modern road car business and concentrate on the classic car side particularly with Historic rally and race car building and preparation. With this in mind a move was made to the current premises at Udiam Farm Oast in January 1990 where we still are today. 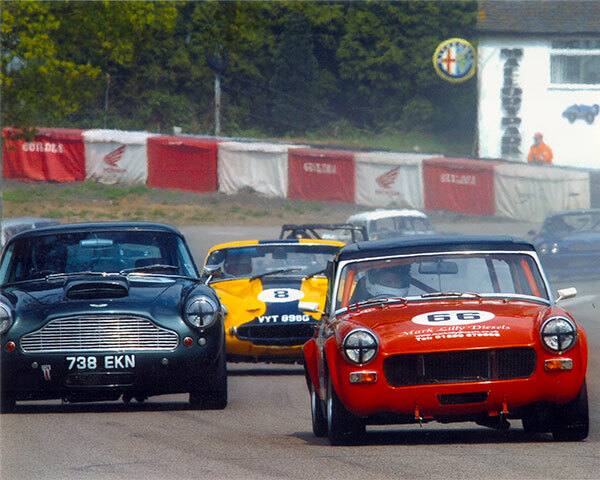 Tony had in fact been providing service back up on historic rallies such as the old Copa de Italia for several years, prior to this for a customer with an Aston DB4 this lead to other Astons being looked after and some major restorations. During the 1990s Aston Martins mostly 6 cylinder cars plus a variety of cars from the old BMC group i.e. Austin Healy, MG, Riley passed through the shop anything from a bare shell up race or rally car to a service on a standard road car. In 1996 Peter Barnard joined his father in the business, having a keen interest in the Motorsport side and having been helping Dad after school and at weekends from an early age, stripping down his first MGB engine at the age of 9 years. After a few years of preparing cars for customers Peter started racing in the MGCC BCV8 Championship at the age of 20 in a Class B MGB that was on loan from a customer. In 2001 for his 21st birthday Peter bought the ex. Barry Coglan MG Midget which was fully stripped and rebuilt at A.J.Barnard Engineering with 1380cc engine, this car was raced from 2002-2005 coming second overall in the class B Thoughbreds in 2005 against cars with engines up 2ltr. 2005 also saw Peter accept the invitation from Jonathon Playfoot to drive the Mk1 Elva Courier previously owned by his father John Playfoot, and raced by Peter’s father Tony in the late 80s. During this time A.J.Barnard Engineering were looking after various club and FIA spec cars in both race and rally form, from MGA’s, B’s, Healeys and Astons. In 2006 & 2007 Tony and Peter competed alongside each other with Angus Dent at the Spa 6 hours in Angus’s FIA MGB. In 2007 Alastair Cox joined the company as an apprentice. Also that year saw A.J.Barnard take on the running of 13COB the ex. Le Mans Cobra. 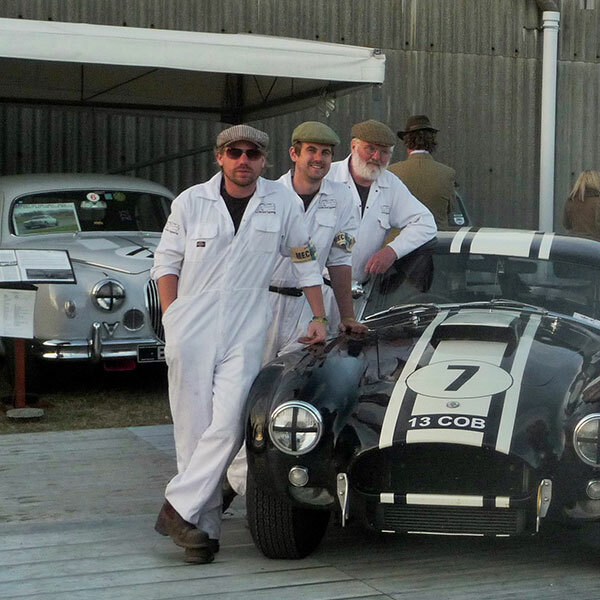 Since taking on the Cobra A.J.Barnard have completely rebuilt the car back to period FIA spec, and have successfully run the car at events such as Classic Le Mans, Goodwood and the Modena Cento ore Classic. 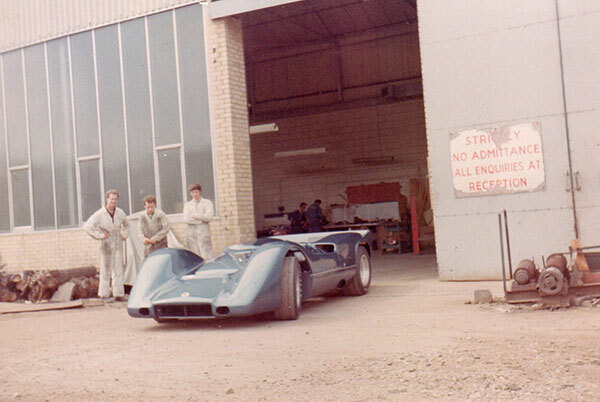 In 2009 Peter was asked by Neville Young, long-time friend of Tony’s to drive his Mk4 Elva Courier alongside the Mk1. Peter has driven both cars with great success, turning the Mk4 into a race winner and winning the MGCC Thoroughbreds Championship outright in 2013 in the Mk1 Courier. Since Peter has started competing he has also guest driven in many cars including MGB’s, BV8’s, Cobra, Aston and historic saloons. In amongst the racing and event support A.J.Barnard have completed many restorations to award winning standards and have attracted customers from Europe and Japan.